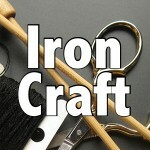 This week’s Iron Craft challenge was based around toys. I knew right away mine was going to be based on Legos. My husband, Matt, loves his Legos to this day. (You should see his office, it’s all Legos and computers.) 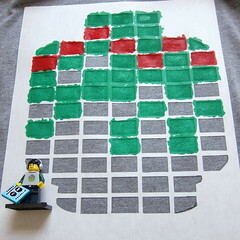 He has been collecting minifigs and when he got this DJ one I thought it would be fun to make him a copy of the shirt. 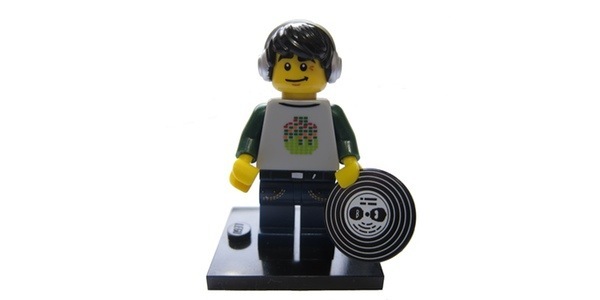 I think it is supposed to be one of those equalizer shirts, but I think it is so funny that the image is in the shape of a Lego minifig head. And here is Matt in his life-sized version. I used freezer paper to make a stencil for this shirt which is a pretty easy technique. Really the hardest part of this project was drawing up the pattern, but lucky you, I’ve included a download of it in the instructions below. 1. 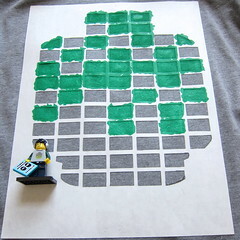 Download and print out the Lego DJ Pattern onto the dull side (non-wax side) of the freezer paper the size you want for your t-shirt. Mine is about 8″x 8″. 2. 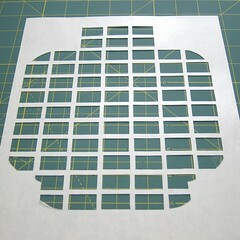 Using the exacto knife and ruler, carefully cut out all the squares in the pattern. 3. 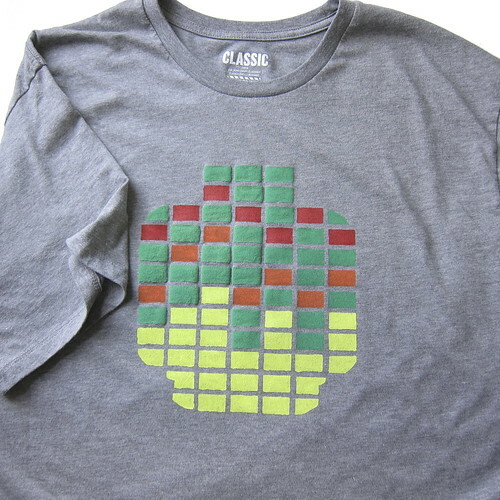 Place the pattern, wax-side (shiny) down, where you want it on the t-shirt. Iron onto the shirt. 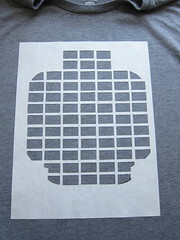 I like to measure and make sure the stencil is centered and straight then pin it in place before I iron it on. 4. 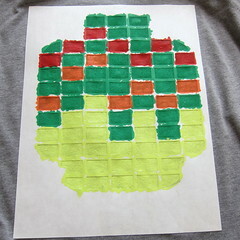 Place a piece of paper or cardboard behind the stencil inside the t-shirt to prevent the paint from soaking through. Paint inside the cut out squares. 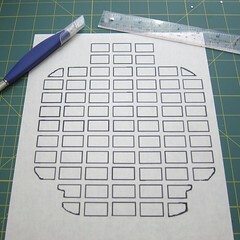 I find it it best to paint towards the center of each cut-out section and not towards the edge. This helps prevent bleeding under the stencil. Let dry (my paint took about 4 hours to dry). 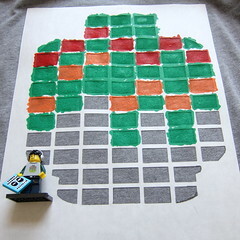 I did one color at a time following the pattern on the Lego. Add a second coat if necessary. You don’t want the paint to be too thick or it will crack with wear. A second coat also gives you more chances of paint bleed. 5. Once completely dry, remove the stencil. Follow the directions on your paint to set it. Usually, it requires a certain amount of dry time and some brands call for it to be set with an iron. Every brand is different so make sure to read the instructions. 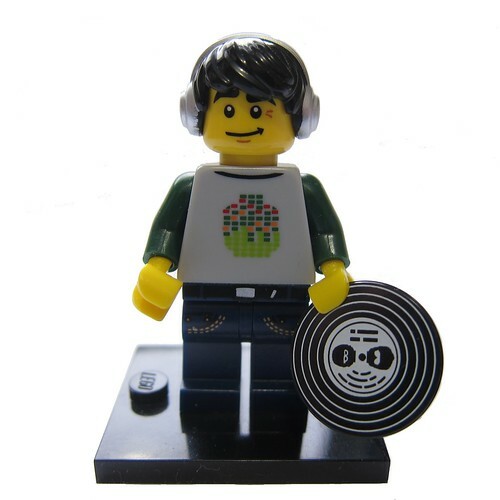 Give to your favorite Lego fan! He is certainly a lucky man. What a great project. How much did you have to bribe him with to get him to pose for you. 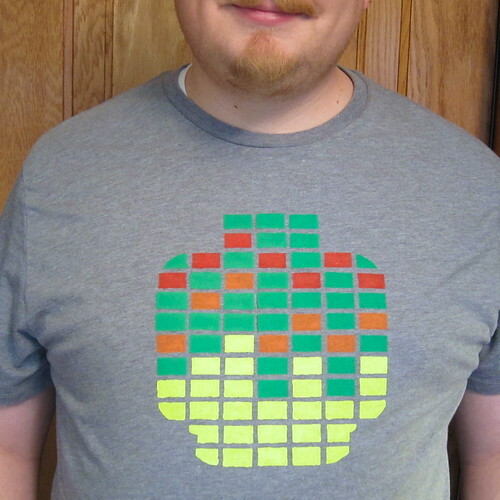 The shirt turned out great. 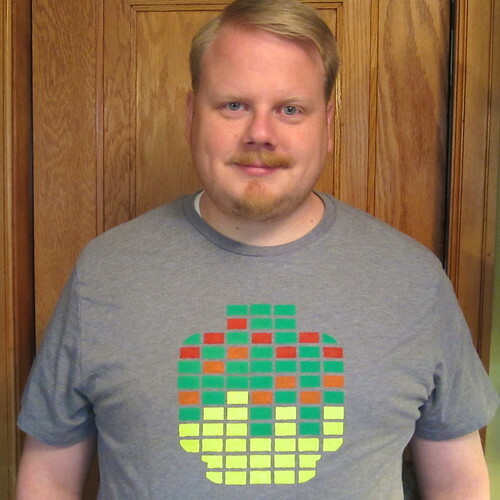 I know a few Lego fans in my house who would love that shirt. This is awesome! My kids would love it.